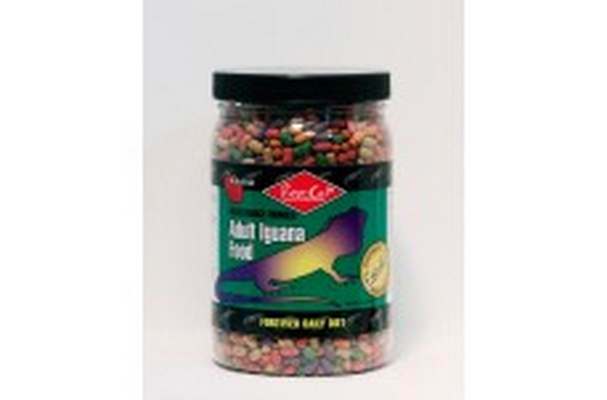 Rep-Cal Adult Iguana Food is formulated to ensure proper growth and health by providing complete and balanced nutrition. It is a veterinarian recommended food containing natural plant and fruit ingredients iguanas love and provides the 100% complete daily nutrition they need. Rep-Cal Adult Iguana Food has been tested successfully for adult iguanas (more than 12 long from nose to base of tail) by reptile veterinarians. It is fortified with optimal levels of vitamins and minerals like calcium and vitamin D3 so no other food or supplements are required. Also, Rep-Cal Iguana Foods contain papaya, mango and strawberries creating an excellent tasting food.